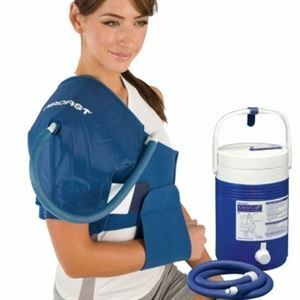 Aircast Shoulder Cryo/Cuff with Cooler and Pump by DJO Canada provides cold therapy benefits to the users giving relief from swelling and pain. The Cryo/Cuff covers the complete area that is affected. Autochill system automatically cycles water between the cooler and the cuff. The repetitive cycle produces cold water and this gives soothing pleasure when applied. This includes Shoulder Cryo/Cuff and a AutoChill system. Recommended for post operation condition and healing process. Pump is attached to Cooler.